2011 taught me many health related lessons. First comes avoid deep fried foods and to work on low calorie diet. After me getting an OTG started grilling whatever possible (for soups, curries) Grilled these gobis and then sauted with veggies and it tasted grt. In a bowl add all the ingredients for marination and make into thick batter (mine was bit watery but made few adj)add in the half cooked cauliflower mix them well and marinate it refrigerated for 15 mins. Mean while preheat the oven to 220 deg C for 10 min. Take a baking tray brush with little olive oil spread the marinated cauliflower and grill it for 20-25 mins in grill mode it is important to turn the florets in between and if reqd brush with some more oil. In a pan add oil once it turns hot add green chillies, ginger, garlic and saute well for 2 mins. Add onions saute well and add in stems of spring onions mix well add bell peppers saute well and add the sauces, gobi 65 and mix them well. Now add the corn flour mixture, salt and pepper and mix them well and cook until they become dry. Add chopped spring onions and enjoy the dish. 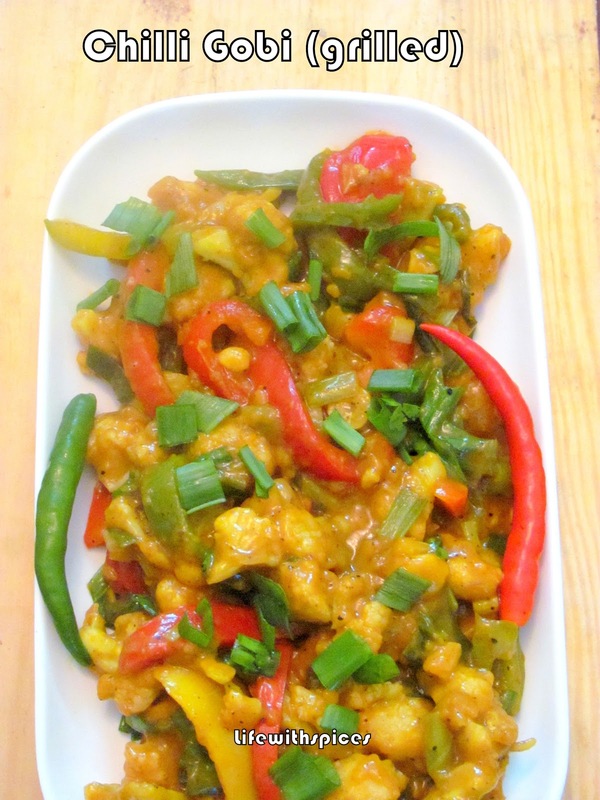 Seriously cant take my eyes from ur irresistible click,super tempting chilli gobi. Looks so good, and yet so healthy..!! good food..! Looks very tempting, a guilt free version with the grilled cauliflowers, love it dear..
Gobhi looks very inviting and mouthwatering. yum yum. 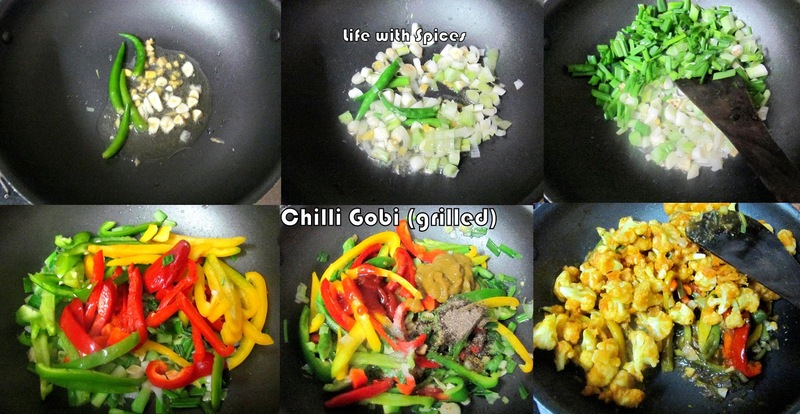 gobi looks mouthwatering and nice idea! good one kalpana- do check out the giveaway in my blog ! 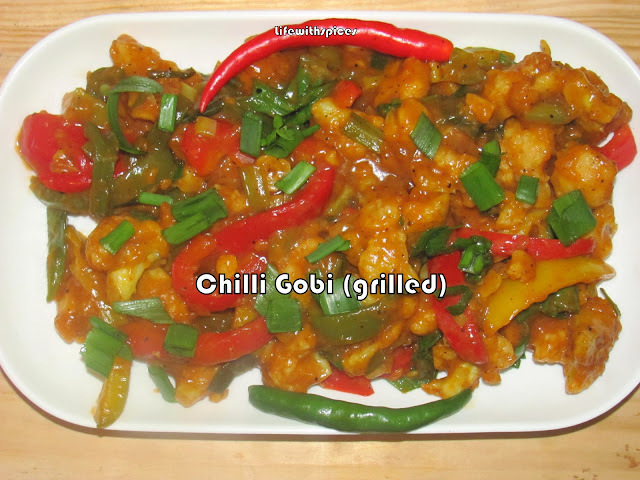 Wow .. chilly gobi looks awesome. Thx for linking to the event. Love your version of this dish. Grilling is a great idea and it looks absolutely delicious. My grand daughter is going to love this! 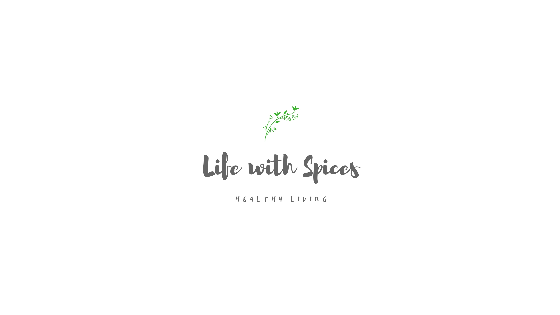 Sounds delicious and nice idea and way of cooking! super delicious, tempting and healthy gobi..